My intention when taking on the Crop Care element back in the beginning of 2013 was to increase the efficiency and regularity of the crop care activities on the farm. Looking back now at the end of the season I feel as though, for the most part, that goal was accomplished. Implementation of a Crop Care Task list combined with weekly field walks was a major aid in keeping up with the requirements of the crops and the pressure of the weeds. In addition, experimentation with various techniques for cultivation and care yielded some good results in determining more efficient practices. Finally, some end of the year number crunching produced a few key insights into required equipment that could be used for future planning. 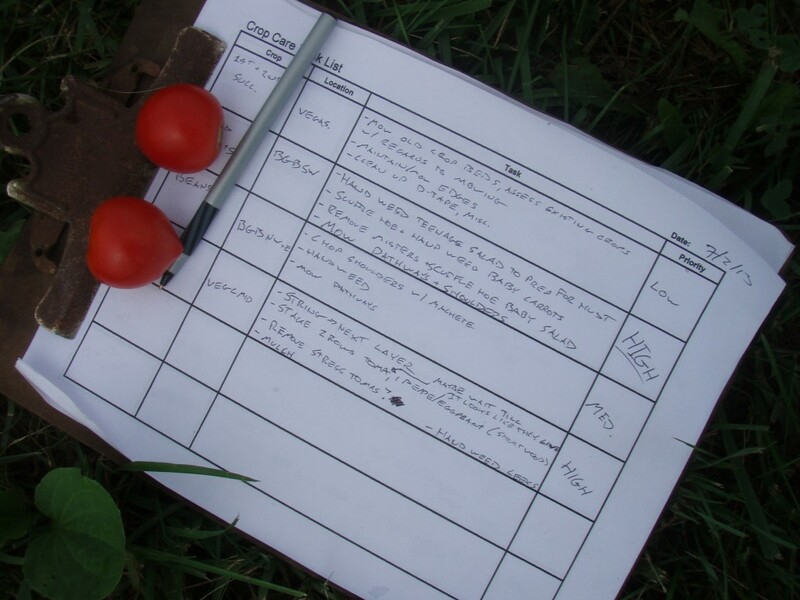 The Crop Care Task List (pictured above) is a simple sheet to be used on field walks to note anticipated crop care tasks for the coming weeks. With headings for “Crop”, “Location”, “Task”, and “Priority” all pertinent information can be recorded and any pressing tasks can be added to the farm’s task list and brought to the attention of the rest of the crew. Hanging the list in an accessible area near our daily task list also encouraged crew to observe the list. Often times activities on the farm can get focused on one area for a period of time and as a result other areas are neglected. I felt having this fuller picture of the farm available for the crew without requiring everyone to take time out of their day for a field walk helped keep everyone oriented on the whole picture of the farm. Also, anyone looking for a job to plug into could simply consult the task list for jobs based on priority and/or whether progress could be made or completed by one person. Checking finished jobs off the list is also great for a sense of accomplishment. So looking back after a season of using a checklist for crop care my conclusion is that it is worth it. It only takes 15 minutes to do the field walk and create the list, which is certainly worth it given the benefits doing so yields. I think a Crop Care Task list is something I would continue to use in the future. We use 220’ field beds, adding together all of our plantings this past season we ended up with about 80 beds for a total of 17,600’. Add to that our flower field of (30 X 75’ beds for 2250’) and you get a total length of crop beds of 19,850’. We use 8 mil drip tape at 12” spacing, which comes in 7,500’ rolls. That comes to 2.6 or so rolls for a season of growing, a 3 roll order if we’re out. Remay is a lightweight cloth material we use to cover crops in order to protect them from cold and pest damage. With the exception of a few more delicate crops we use remay at the beginning and end of our growing season. Experience has shown that we need to cover around 16 field beds at any one time as well as a number of our Big Garden Beds (8 or more). In the past we had used different width pieces for the different jobs, single row covers for the field and wider pieces for the BGBs. However having experimented with different sizes it seems 16’ width is ideal for North Slope. It fits the BGB’s without too much excess material left in the pathways. At the same time it can fit 3 field beds, 4 if they are spaced more tightly. Covering more beds with fewer pieces is much more convenient: fewer pieces to handle and store, fewer sandbags to haul, and quicker to cover/uncover crops. We reuse what we can and labeling the remay when it’s rolled up is a big help when it comes finding the right piece. For 16 field beds and 8 BGBs we would need around 1700’ of remay, or two rolls. With the tomato plants having a 2 foot spacing, we have a stake every 4 feet. 220’/4 is 55 stakes total. Dividing 55 by 3 gets you 18.3, that’s how many metal stakes per bed and (18.3 X 2) 36.6 is how many wooden stakes per bed are required for this pattern. When creating this order we round up and add a couple extra. 20 metal per bed X 8 beds is 160 metal stakes, 40 wood X 8 beds is 320. That is our yearly need for tomato stakes to trellises our field tomatoes, checking that against our inventory we know what we need to order for the next season. Last year for example, we used a number of our metal tomato stakes to trellis our blackberries and needed to order replacements. At North Slope we use a variety of options for the cultivation of our crops, from hand weeding on up to mechanical cultivation using tractors. This past year we added a few new tools/techniques including a backpack flame weeder and an older BSC rototiller for cultivation. Below I will explain our practice and add my observations taken over the past year. Hand weeding is one of the more tedious jobs on the farm and one of my goals this past year while focusing on crop care was to reduce how much of it we had to do. To achieve this I tried to time other cultivation activities for maximum impact. Even with good timing however, hand weeding is a necessity. Our salad mix and other crops in the BGB’s in particular require some hand weeding at some point. The best case scenario is to hand weed after a second scuffle hoeing, were the only remaining weeds are those growing tightly interspersed with the crop. Two crew hand weeding is probably the realistic minimum, however progress will be slow and therefore it becomes hard to sustain motivation and keep up efficiency. 3-4 crew would be a better minimum, to allow for some leap-frogging down the bed. 4-6 is better, as crew can work in pairs across from each other and still jump down the bed as they reach previously weeded sections. Working with an odd number it is a good idea to take turns jumping back and forth across the bed to keep the group together. Working close enough together for a conversation greatly helps moral. We have a variety of hand hoes, diggers, choppers, etc; however those seem most useful in perennial bed hand weeding, for our BGBs it seems hands are faster. We use scuffle hoes, or stirrup hoes, from Johnny’s. These are a great tool for cultivation, and it pays to have one for every crew member as a full crew scuffle hoeing can clear a lot of weeds in an afternoon. Scuffle hoes are best used when weeds are at thread stage, before they start getting hardy, and in drier conditions if possible. Scuffle hoeing in wet conditions can be less effective or impossible and disturbed weeds my also re-root if enough moisture is available. Scuffle hoes do a shallow cultivation that doesn’t bring up too much new weed seed. Two crew minimum works well, however one person can still accomplish a lot. Two people scuffle hoeing can usually weed one BGB (110’x4’) or one field bed in about 10-15 minutes. With a larger crew of 3-6 it’s possible to very quickly cultivate a couple of beds in a few minutes of down time between jobs or spend a half or a whole day really cleaning up the farm. In the BGBs we seed in rows diagonally across the bed spaced tightly so our 3 ¼’ scuffle hoes just fit between the crop, this makes for very efficient hoeing. It seems best to hoe initially right after germination and then again 1-2 weeks later depending growth. After the second hoeing, hand weeding is usually needed but quicker as the hoeing has cleaned most of the weeds. From here with quick crops like our cut leaf salad mix, ideally the crop growth out competes the weeds and we can get to harvest without too much more crop care. With longer term crops like carrots a 3rd hoeing may be possible but another round of hand weeding is usually needed. In the field beds, regular scuffle hoeing can be effective at keeping beds clean. In my experience two people working across from each other is the best set up, with each person hoeing perpendicular to the other creating an X pattern around the crop rather than each individually trying to fully clear around a plant by themselves. Extra crew can be added to leap frog and/or focus on the bed shoulders. In any case, communication is important so everyone knows there role in the process. When the crop is too mature for mechanical tractor cultivation this system works well with the BCS pathway cultivation. In both cases removing the irrigation tube or tape is necessary to be most efficient. Irrigating after hoeing seems to really boost crop growth. For the first time in a while at North Slope we got the old propane backpack flame weeder down from the barn top and got it working. It was a bit finicky and difficult to get going, and seemed to cut out after 30 minutes of use, however we managed to use it to good effect. Carrots are slower growing and are harder to keep weed free as the weeds will germinate first, obscuring the rows and making scuffle hoeing difficult. By flame weeding at 5-7 days after seeding but before the carrots really start germinating most of these early weeds can be killed, and since the soil is not disturbed new weed seed does not come to the surface making for lighter weeding later on. Timing is vital with flame weeding, daily observation is necessary to find the right moment. However, once, while flame weeding a bit late, after the first carrots had already begun germinating, the results were not too bad as enough of the seed was still in the ground to give us a good yield. It seemed that one tank of propane would last us 3-5 BGBs and was fairly cheap to refill. It is not necessary to burn the weeds, the heat is what kills. A fairly steady pace should be maintained, moving the flame nozzle back and forth as you walk down the bed. It takes about 10 minutes to flame weed one BGB and the head start it gives the carrots is very noticeable. It will be 2-3 weeks before scuffle hoeing is needed and by then the carrots will be well established. We mostly use a wide scuffle hoe attachment on our wheel hoes for cultivating field bed shoulders and pathways. The wheel hoe’s efficiency depends greatly on soil conditions and level of weed growth. In the right conditions, dry but not too dry and weeds at thread stage, it can be a breeze to clean up a field after scuffle hoeing between crops. It takes 3-4 passes to clear from bed shoulder to bed shoulder, and in good conditions it took 2 crew wheel hoeing less than an hour to clean up a 16 bed field. The wheel hoe works best when moving at a brisk pace and can be a bit of a work out. In anything but ideal conditions however, the wheel hoe can be unpleasant to use. When going out to a field for weeding it’s good to bring them and test to see if conditions are good for use, however using the BCS was faster and more versatile in all soil conditions. We use a BCS walk-behind rototiller as part of our bed preparations in the BGBs. Most BCS’s rototillers depth can be set and changed fairly easily, so cultivating can be done quickly when using the shallowest setting. We had an old BCS with a number of mechanical issues, however we managed to get running and used it this past season for cultivation of field bed shoulders and pathways. The older model we have is narrower and fit nicely down our pathways even, for the most part, with mature crops. This was a great benefit, because at a certain point crops become too tall for our tractors to mechanically cultivate. With the BCS we still had a quick and efficient way to keep those mature crops weed free. Taking two passes on a pathway lets the operator focus once on each bed edge and really get close to the crop. Soil is also tossed out from the rototiller in a way that can smother weeds another couple of inches into the bed. The old BSC also has functioning differential braking, allowing for a lot of fine control to get close to the crop. Combining the BSC cultivation with scuffle hoeing for field crops seemed to be an efficient way to control weeds in mature crops. Hoe after the BSC has gone through the pathways, otherwise you may end up hoeing more than you needed to as the BCS can safely get very close to the crop. Some important notes and warnings for anyone planning to use the old BCS in future: the old BCS is DANGEROUS! Only attempt to use it if you are comfortable and confident with machinery! Firstly, the clutch does not work correctly. You should still engage the clutch to shift, but do not expect this to work while the machine running. It must be rolled into place for starting, and started already in gear. Doing this with two people is safer, one to control the machine while the other pulls the start cord, however it is possible for one person to start it, just be sure to get clear when it starts moving which it will do as soon as started. Secondly, the gear selector rod is missing. Use a small hammer or rock (shifter rock) to tap the gear shift into position. The gears are no longer where they should be according to the machine’s indicator, nearly all the way tapped forward you should find 3rd gear which is best for cultivation and slightly back from there you should find neutral. Remember, only shift gears with the machine off as the clutch cannot be trusted! Thirdly, the safety shut off is also not reliable. Stop the machine using the choke, always have space to continue forward or turn. Do not operate the machine in close proximity to other people or animals because you cannot rely on it to stop quickly. Fourthly, the PTO cannot be disengaged. This means the rototiller will always be spinning, so BE CAREFUL. Throttle down and lift for making turns, but keep well clear of the spinning blades. Occasionally the PTO will disengage itself while working; it can be reengaged but not reliably disengaged. Be especially careful when loading and unloading from the ATV trailer if you do so with the machine running as the rototiller will also be running. It is safer to get two people to push it up the ramp manually. Even if loading or unloading manually be aware of the machine’s weight and be sure you can get clear should it fall. Don’t try to catch it! Finally, always pay full attention while using the machine. Even more so than the newer BCS, the old one is lighter and jumps significantly when it hits a large rock and I’ve had it both move backwards towards me and shoot forwards at considerable speed. Always keep in mind where you will go to get clear of the machine should this happen. Also, the choke pin may slide out while operating, opening the choke. You will notice the sound of the engine changing, be quick to push it back or you will have to restart the machine. Even with all those difficulties I still enjoyed using the machine and I think it’s a great cultivation option, especially with a more functional model. However, I really would not recommend anyone with any doubts or concerns to use “El Duce”, it is not worth getting hurt for. Two years ago North Slope Farm got a new cultivating tractor, an IH 265. Before this mechanical cultivation was done with the IH140 using a series of shanks, spiders, and sweeps, all individual implements that would need to be rearranged for each job. Since the IH140 is also used for building our beds this meant a lot of time changing the setup. Having two tractors meant having to do that less often. More than this though, the new 265 has a 3-point hitch letting us make use of our Williams Toolbar. The Williams Toolbar is a steel frame with a number of adjustable spring tines and two bars on which other implements can be attached. Having one implement you can dial in for a tight cultivation and leave set up is a great time saver. It can be picked up, quickly checked and tuned and ready for the field in less than 10 minutes. And once the operator is comfortable with the toolbar, cultivating a 16 bed field can be done very quickly. We plant two rows per bed for the most part so once the crop hits a certain size it becomes difficult to cultivate the center strip using the toolbar, however the toolbar can still clear the bed edges and pathways leaving only the center strip to be scuffle hoed. When the plants become fully mature it can be difficult or impossible to cultivate using the toolbar at all, as even the retracted spring tines will rip and damage some crops. However the easy adjustability of the spring tines gives some flexibility in quickly moving between crops of different size. The Williams Toolbar can be used at all stages of the crop, until they are too large to drive over, and works well enough that it can really be the only cultivation method needed for the first few cultivations. A quick touch up scuffle hoeing helps keep the few missed weeds from maturing before the next round with the toolbar and is fairly quick. The key with the toolbar, as with all of the other cultivation options, is with timing. The toolbar will eliminate thread stage weeds and be effective slightly beyond that point to baby/adolescent stages. After that however, as we observed while experimenting with the toolbar and bare fallowing some prebuilt beds, the toolbar is not effective at killing grown weeds. Taking on the Crop Care element as a focus in my third year here was a valuable experience. I got to really be involved with the various crop care tasks and develop a good understanding of the needs of the crops. Being focused on crop care also helped me to hone my knowledge of weed varieties and learn and trial effective means for dealing with them. I also had the opportunity to gain experience managing a crew in the execution of crop care jobs, keeping task oriented and efficiently moving from one job to the next making the most of limited time. More than anything, having this as my focus drove home the preeminent importance of timing with regards to cultivation. Having done the planting focus and crop plan my second year and crop care focus my third year I feel I’ve gained some good experience in some key areas of farm activity, and I feel having chosen these to focus on has prepared me well for my future career in farming.